15 May 2014 [updated with December 2014 survey results]. Article by Karl Fjellstrom, for ITDP. 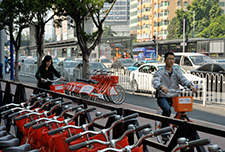 BRT impact analysis surveys in Guangzhou, where the BRT opened in February 2010, show a dramatic improvement in bus passengers' perception of reliability of bus service at the same time as perceptions of reliability have markedly deteriorated in a non-BRT corridor surveyed for comparative purposes. Passengers who 'agree' or 'strongly agree' with the statement that 'bus service is reliable' increased from 31% before the BRT to 63% in the survey in December 2013. Over the same time in the non-BRT corridor passengers agreeing or strongly agreeing that 'bus service is reliable' fell from 49% to 28%. Passengers in the BRT corridor who saw bus service as very unreliable (either disagreeing or strongly disagreeing that 'bus service is reliable') fell from 40% before the BRT to 13% in December 2013. 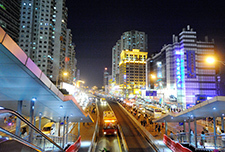 Indeed the dissatisfaction rate with bus service reliability has stayed consistently in the range of 10%-13% of passengers since the BRT opened, whereas in the non-BRT corridor the percentage of dissatisfied passengers has been steadily increasing, from 15% in December 2009 to 26% in December 2013. 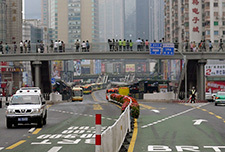 This is presumably due to steadily increasing congestion in Guangzhou resulting in a worsening of bus service reliability in non-BRT roads but having a much smaller negative impact on the reliability of bus services inside the BRT corridor, due to the physical segregration of the BRT stations from mixed traffic and the dedicated BRT lanes. It is worth noting that before the BRT, many more people were dissatisfied with bus service reliability (40%) than were satisfied (31%). 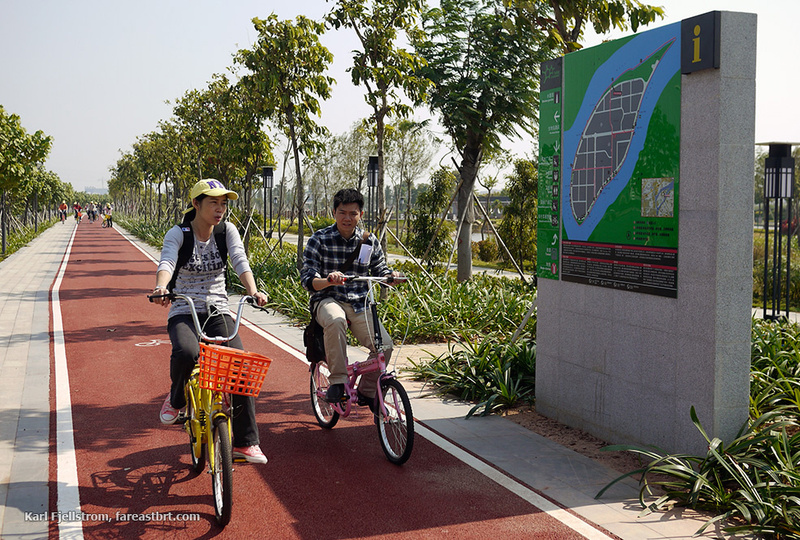 After the BRT opened passenger perceptions were reversed, with 63% satisfied and only 13% dissatisfied. 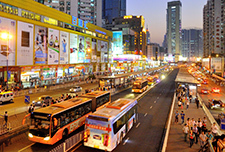 Bus service reliability is a key measure of the quality of any urban bus system, because passengers needing to arrive at a destination on time need to know that they can rely on buses to get them there. 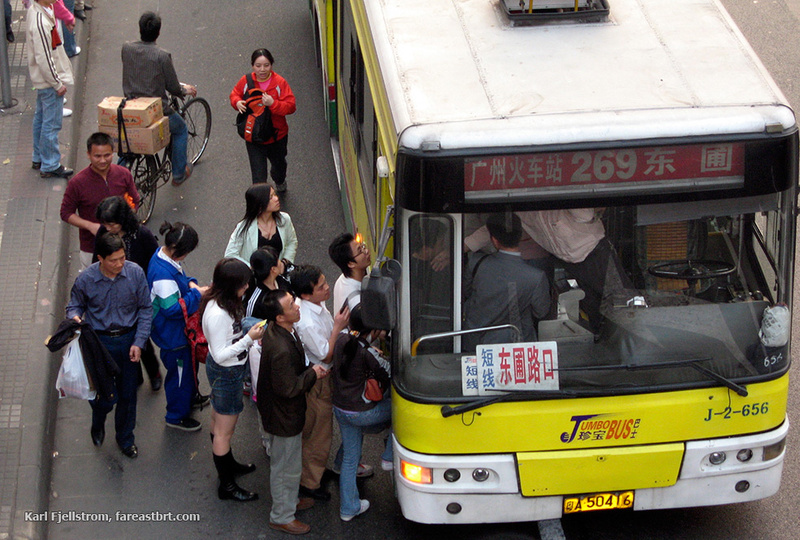 Passengers boarding a bus in Zhongshan Avenue in 2007, before the BRT was implemented. The driver is trying to assist passengers to board. Route 269 would later become route B2 in the BRT system. 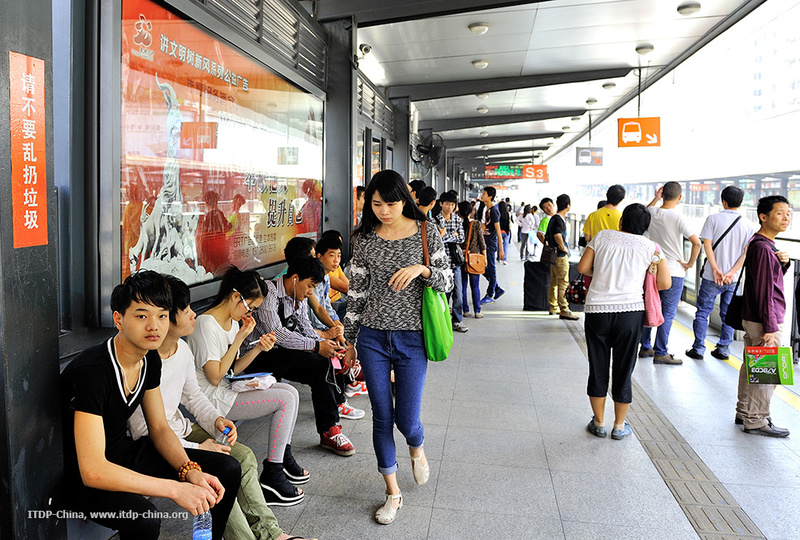 Passengers waiting for buses at the BRT station now have a much more pleasant and reliable experience. 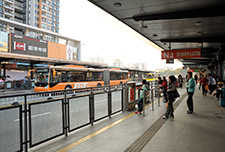 For the results outlined above, around 1,100 bus passengers were surveyed by ITDP in each of the BRT surveys, and 300 bus passengers in each of the control corridor surveys.